There is a beautiful 7 kilometer beach with all the standard facilities.The thin golden pink sand of this beach and the trees along the seafront create an exotic setting.You can find water sports. Bus service from Chania every 15minutes. 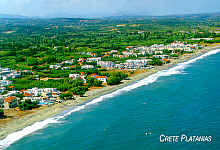 There are plenty of bars and restaurants next to the sea but if you want a quiet beach just go to Gerani or Maleme.The beach in Platanias area is awarded with the Blue Flag award from the E.U. for several years. There are lifeguards in the most busy areas. find more information about the Blue Flag award.